Here is another glass bottled I have decoupaged and upcycled. I really love this one.And I have a step by step tutorial for it. That is the first step to make. 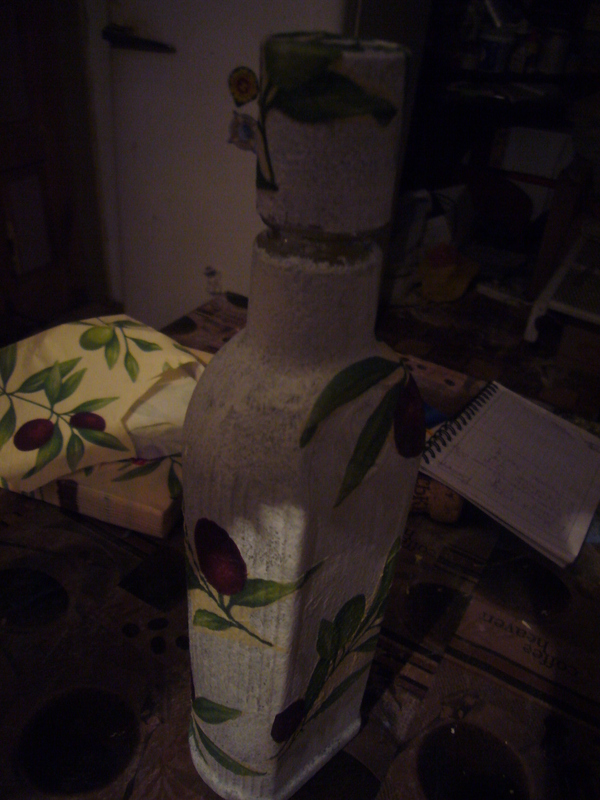 I have repainted the bottle, using a piece of foam and white acrylic paint. This is another one of my decoupage and upcycling projects. 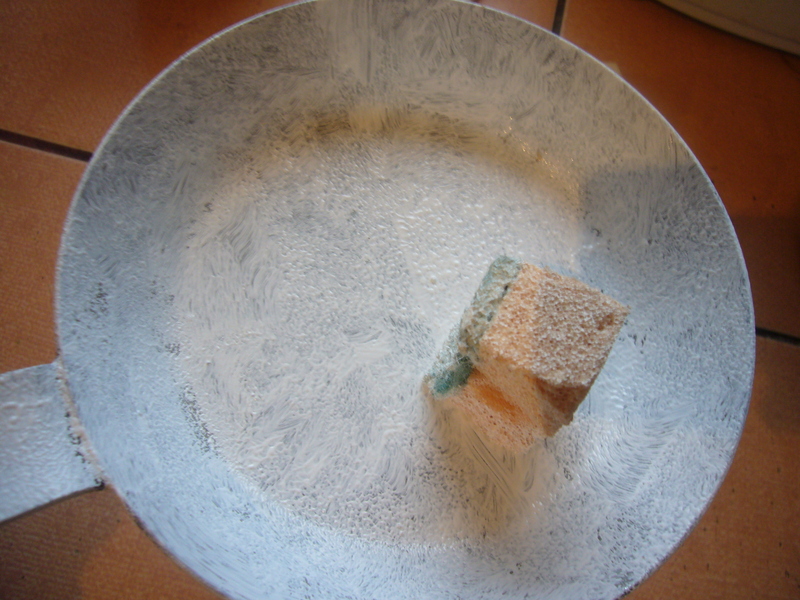 It’s upcycling an old pan, but you can see a little piece of foam I usually use for painting things. Unlike the brush, foam does not leave strokes and makes the paint look smooth and even on the decoupaged objects. The next step is to cut out the napkin pattern for decoupage. Sometimes I try to cut them out carefully, while most of the times I just cut out a larger piece of pattern. Then I wet my fingers and rip off the edges to make them look uneven. This way, your napkin resembles the hand painting on the objects. Here we go. The bottle is almost done. I have decoupaged it with the olive pattern, using transparent all purpose polish. Usually, I put a very sparing amount of polish on the bottle. I use a soft brush to do that. Then, I stick the napkin and add more polish. You have to cover up the entire bottle with the polish to prevent it from getting water damaged. However, I do not do that untill al the napkin patterns get well dried up. If you touch the napkin or the paint with the wet polish on, they get stuck to your hands and you simply ruin your decoupage projects. So, let it dry well and then cover up with another polish layer and let it dry again. Here is the final touch to this glass decoupage project tutorial. I added some strokes of silver paint all over the decoupaged bottle. Do you forget to add another layer of polish, once the paint gets dried up. 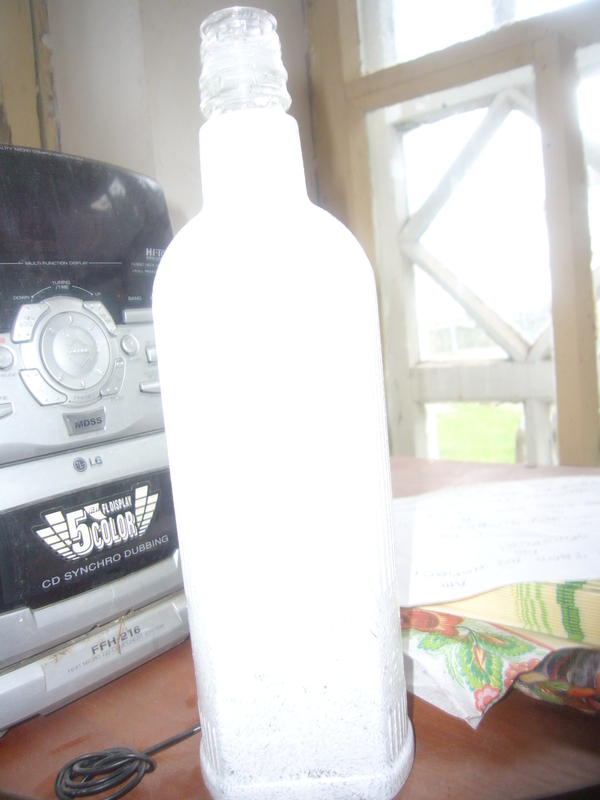 This will prevent your bottle from getting spoiled by water and make it more or less invulnerable to scratches. Even though this glass bottle decoupage tutorial has many steps to follow, it is easy and the actual decoupaging process takes less than half an hour. Although, you have to wait for a while for the paint and polish to dry up. This entry was posted in Crafting Tutorials, Decoupage ideas, Uncategorized and tagged bottles, crafts, creative tips, creativity, decoupage, decoupage how to, decoupage ideas, DIY, do it yourself, glass bottle decoupage tutorial, green living, handmade, home decor, home design, housekeeping, mod podge, tips for moms, upcycling. Bookmark the permalink.